When I think about South African desserts, I think of malvapoeding, asynpoeding, Jan Ellis-poeding and brandy pudding. However, I think melktert is probably the most famous of all the South African desserts. 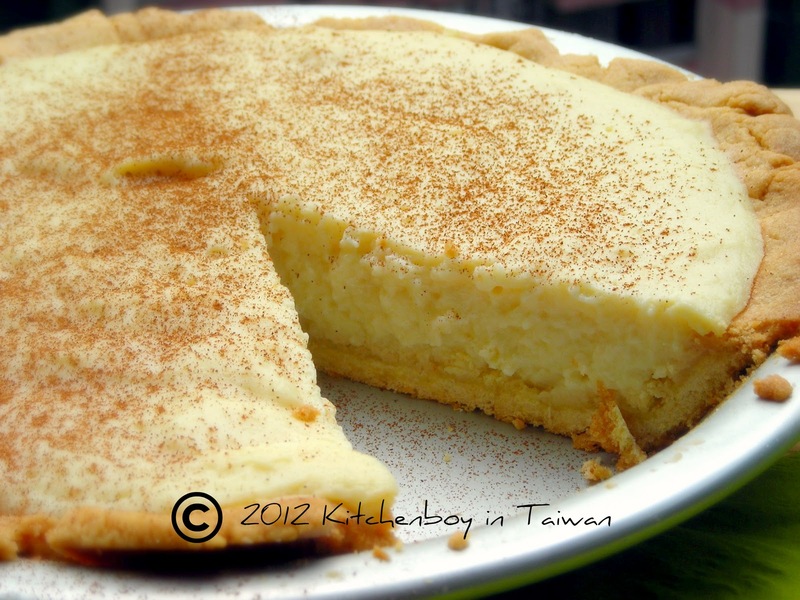 Melktert (translated as "milk tart" in English) has been made in South Africa since the time of the Dutch settlers in the Cape and consists basically of a sweet crust, filled with a milk and egg custard. 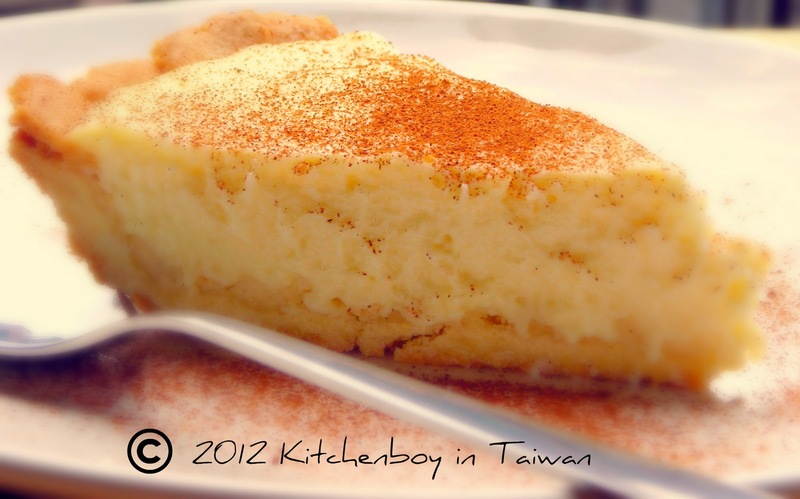 Although similar to a traditional European custard tart or Chinese egg tart, it contains a higher ratio of milk, so it is lighter in colour and texture and has a stronger milk flavour. Press the dough into a greased circular pie dish (traditionally an enamel plate) and bake at 180 ̊C for about 15 minutes. Bring the milk and butter to the boil. The stoves in Taiwan are very hot, so take care not to burn the milk. Cream the sugar, eggs, corn flour, flour and vanilla essence. Add some of the hot milk to the creamed mixture, then pour it back into the pot and heat gently until it thickens. Pour the filling into the pie crust and let it cool. Refrigerate until required and sprinkle with ground cinnamon to serve. Enjoy with a steaming cup of freshly brewed coffee. I want to eat it....just want to eat it.....when r you going to make one??? This is delicious! My beautiful South African friend Chantal made this for me YUMMY!!! Love your posts! Lived in Australia my whole life, but was raised by my Afrikaans parents on bredies (exactly the same as yours, right down to the silky sheen on the gravy that comes from cooking the meat properly! ), koeksisters rolled in syrup and coconut, potjiekos and peas & carrots stew, and of course, milktart! Thank you for the visit! It seems like your parents raised you on all the South African staples, just like I was. Mmmm...I love a good green bean stew with a very good grinding of black pepper!